Ken Goyer describes the "sprocket rocket" charcoal stove and its use in Uganda. This is a bicycle sprocket. 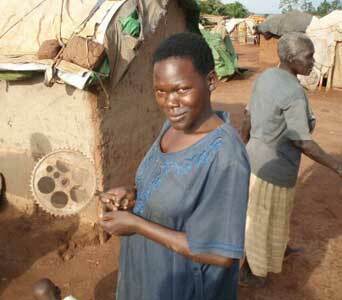 I was visiting a camp near Lira and this woman came along holding this sprocket. She said that she was planning to make a Sprocket Rocket and that she had paid 1000 shillings (about 54 cents) for it. While I have adopted the position that people should not make charcoal burning stoves because they are inherently wasteful, and dangerous, I have been overruled by popular opinion in the Uganda Refugee camps. Burning charcoal is customary and is sometimes necessary when there is no other fuel available. While rural people are accustomed to and prefer to burn fuel wood, city dwellers rely extensively on charcoal. But when fuel wood is not available to gather, people are forced to buy charcoal, sometimes by trading some of their precious food in order to cook the remainder. For a long time, people have made stoves using a bicycle sprocket for a grate. But the introduction of the insulated brick has made possible the construction of what is now called the “Sprocket Rocket”. It differs mainly in that combustion takes place in insulated surroundings. broken bricks. I was slow to catch on that they were using them to make the charcoal burning Sprocket Rockets. The Sprocket Rocket was the idea and creation of Mary, one of our stove promoters and teachers. The half bricks are wired together in the same fashion that the regular six brick rocket stoves are formed. Some people use five half bricks for a bottom (leaving a hole for the door), they put their sprocket on next and then six more half bricks for a top. Some people use insulated bricks only for the top half. Like the SixBricks Rocket Stove, the owner can finish her stove any way she likes. The talk is that the Sprocket Rocket uses one half as much charcoal to cook as the traditional charcoal fire. Charcoal is delivered all over Uganda in bags like this. They cost about 12,000 shillings each (About $6.50). Pictured are our three original stove promoters, Francis, JK, and Mary. They have been responsible for making over 10,000 SixBricks Rocket Stoves (and untold numbers of Sprocket Rockets) in Lira refugee camps. Large sacks of charcoal are broken down into small bags for “retail” sale. Charcoal dust and fines are saved by mixing with clay and forming into balls which are then allowed to dry. These are also sold.